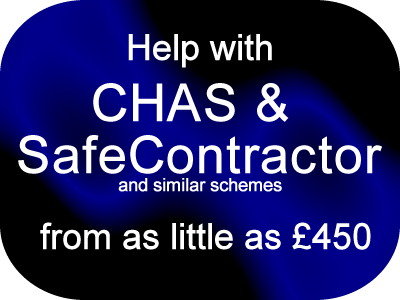 All of our construction clients and many of our other clients in other industries are - or are working towards - registration with CHAS or other similar schemes such as Safe Contractor and we are here to help you register. We will work with you to put together the necessary systems and procedures to qualify for registration and then guide you through their day to day implementation. Remember, registration with companyies like CHAS is not about having a neat Health and Safety file with lots of generic pieces of paper. It is about proving that health and safety is embedded in your business. Our small business package is ideal for small business in the construction business - builders, property maintenance, electricians, plumbers, plasterers, roofers and the like. The fastest growing health and safety assessment scheme in the UK with over 46,400 suppliers registered. A non-commercial scheme available to suppliers (those who provide goods and services) and to organisations (buyers) looking for suitably competent suppliers.